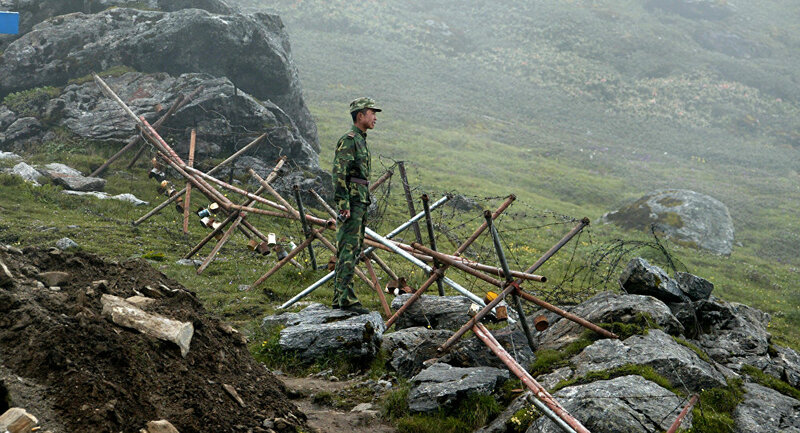 While the 73-day long standoff between the Indian Army and China’s People’s Liberation Army (PLA) at the Doklam plateau last year put the spotlight on the war preparedness of both forces, it also put the extent of infrastructure development by both sides along the border on the radar screen. New Delhi (Sputnik) — A recent report presented by India's Minister of State for Defense in Parliament recently shows that while China has built a number of fully-operational airbases, an extensive rail network of over 5,000 km and over 50,000 km of roads in the Tibet Autonomous Region through which it can move over 30 divisions each with over 15,000 soldiers to the Line of Actual Control (de facto border with India), the Indian government has not been able to expedite road projects that are almost a decade old and 14 rail projects still remain on paper. According to the report, Indian agencies have only managed to build over 255 kilometers of roads in the last four years. Progress is so slow that at the current rate of speed, the 3,417 kilometer-long Indo-China border road project, the original deadline of which was 2012, is unlikely to be completed by the revised deadline of 2022. Nevertheless, the Indian government has preponed the deadline by two years and asked the agency — Border Road Organization (BRO) to complete the project by 2020. The Indian government has identified 73 roads as strategic Indo-China Border Roads (ICBR), out of which 61 ICBRs have been entrusted to BRO that should cover a total length of 3,417.50 km. However, a recent report suggests that only 28 roads have been completed to date and there has been not much progress on another 33 in the pipeline. Subhash Bhamre, India's Minister of State for Defense said in Parliament on Monday, "to date 981 kilometers of roads have been completed and work on 2,436 kilometers are still going on." According to the ministry documents, out of 61 ICBRs with BRO, 19 roads of total length 625 km had been completed way back in January 2015. Since then, only 255 kilometers of strategically critical roads have been completed. In the last two months, in fact, only 18 kilometers of road have been added along the Chinese border. Out of 61 roads, 27 are in Arunachal Pradesh, five in Himachal Pradesh, 12 in Jammu & Kashmir, 14 in Uttarakhand, and three in Sikkim. "There are delays in execution mainly due to delay in forest clearance, hard rock stretches, limited working season and difficulties in the availability of construction material," the BRO said. During the Doklam stand-off with China, Indian Army Chief General Bipin Rawat had asked agencies to expedite infrastructure development work along the Line of Actual Control (de facto border) terming the inordinate delay in construction projects "alarming." Indian Army Chief General Bipin Rawat had also called for the construction of four passes bordering China, the Niti Pass, Thang La Pass, Lipulekh Pass and Tsang Chok La Pass- by end of 2020 in addition to the 61 ICBRs. Last year, the Indian defense ministry had delegated administrative and financial powers to local BRO units besides allowing outsourcing to augment the capacity of BRO. However, not much progress has been reported on the ground. Meanwhile, the Indian Army is reportedly not too happy with the quality of completed projects. The Army has claimed that the quality of the roads does not support the swift movement of vehicles and infantry to meet any contingency arising from a possible conflict with China. Chinese troops have crossed the Line of Actual Control (de-facto border) 426 times in 2017 in comparison to 271 in 2016, according to India's Ministry of Defense. Indian and Chinese forces were involved in a bitter stand-off for 73 days last year following the Indian Army's intervention in the Chinese army's road building activity near Doklam — an area claimed by China as well as Bhutan. There were reports of stones being thrown between the two forces at Pangong Tso Lake in Ladakh when Chinese forces allegedly tried to enter Indian Territory. According to an independent estimate, the number of face-offs also shot up to over 220 in 2017 from 146 in 2016. Nevertheless, the Indian Defense Ministry has so far sought to play down the marked increase in transgressions, attributing them to the delay in the proper demarcation of the border.